Severe flooding due to heavy rainfall in the UK continues to be a real threat. Halcrow looks at mitigating the consequences by determining the risk faced by critical assets such as water treatment works and pumping stations and weighing these up against the cost of appropriate preventative measures. The process is subject to a great deal of uncertainty, which Halcrow quantifiesusing @RISK. This ensures that informed decisions are made on the best action to be taken. Halcrow (www.halcrow.com), a CH2M HILL company, delivers planning, design and management services for developing infrastructure and buildings worldwide. It contributes to the construction, operation and maintenance of the built environment, and the protection, enhancement and maintenance of the natural environment. The company has used Palisade’s decision support software tools on various projects. Following severe flooding in the UK in the summer of 2007, Halcrow’s water industry Asset Management team was commissioned by Ofwat, the economic regulator of the water and sewerage sectors in England and Wales, to produce a Service Risk Framework (SRF). This detailed analysis assessed the resilience to flooding of critical assets such as water treatment works and pumping stations which, if damaged, resulted in major disruptions to water supplies. Halcrow then embarked on a project with a UK water utility company to implement the SRF to identify how the consequences of similar events in the future could potentially be mitigated. Following a high-level risk-based exercise to screen and prioritise key assets, Halcrowundertook detailed analysis of risk for selected sites. The process is subject to many elements that are difficult to predict with a high degree of accuracy. Halcrow therefore uses Palisade’s risk analysis software @RISK to understand the magnitude of uncertainty of the overall analysis. Working with UK Environment Agency data, Halcrow studies the likelihood that a site will be subject to fluvial flooding (flooding from rivers). The next step is to quantify the vulnerability and consequence of failure for each asset. Even when the probability of an asset flooding is low, if the impact when it does is severe, mitigating action may need to be taken. Understanding consequences by quantifying them is therefore a key element in Halcrow’s project, as it helps to determine the level of activity required. The site screening process considers topographical factors, such as whether the water plant is high up, but near a riverbank. It also looks at operational factors via the knowledge of the people who work there. These might include the information that there is a flood wall in place that isn’t widely known about, as well as facts such as if the site is problematic based on historic events, including whether it flooded in previous years. Sites considered ‘at risk’ after this assessment undergo further evaluation. The next stage of the risk assessment goes into more depth by undertaking quantitative analysis that puts numbers on probabilities and starts to look more at the uncertainties. River model data is used to determine the probability of flooding happening each year. Statistics on the depth of rainfall, combined with factors such as the length of time for which it rains, determine how the volume of water in the river will be affected. These calculations turn rainfall event information into useable figures for the amount of water to expect in a river in different circumstances. The key objective is to establish the flood hazard in terms of the probability of specific (high) river levels occurring. Site surveys are also carried out to ascertain the position of sensitive or critical equipment. These record the water level at which individual pieces of plant will no longer function and also initially help to evaluate whether more adaptive solutions (such as raising the position of the equipment) may be viable. Recommendations to improve flood resilience may include adaptive solutions, such as designing structures to reduce the consequences of flooding by facilitating recovery from it. Alternatively, resistance, which takes a more risk-averse stance by aiming to prevent flooding in the first place, might be more appropriate for some sites. Understanding the certainty with which forecasts can be made is an important element of the decision making process, and @RISK plays a key role in quantifying this. For example, rectifying the consequences of a flooded water treatment plant can be very expensive. The physical damage to pumps and equipment needs to be repaired, and there are additional costs that may be incurred, such as bottled water supply while the plant is out of action, and customer compensation for lack of service. Working out the costs of these consequences will help to determine the right solution for the individual site. However, it is difficult to quantify the exact costs so @RISK is used to quantify the variations in the figures. Inputs to the model include the relationship between water level and the damage to the site, the duration of the incident and recovery time, and the number of customers served by the works. @RISK was also used to measure levels of uncertainty for other key aspects that have a bearing on the eventual outcome. For example, it was recognised that there are uncertainties around the direct damage costs and the expense of responding to customer contacts associated with the incident. At the same time it is important to understand the level of uncertainty in the costs of intervention, such as building a floodwall. In addition, fluctuations in the cost of borrowing money must be accounted for as these may have a significant impact on the final expenses. Any calculations around flooding must also reference the impact of climate change – itself a huge unknown – on storm frequency and hydrology. Data input to the @RISK model can include higher river levels to reflect the anticipated increase in rainfall. Using @RISK, Halcrow can demonstrate how decisions on the best course of action to take for a critical water industry asset can be informed by quantifying the uncertainty. Option 1 in the diagram below shows the difference between doing nothing and developing an intervention that will offer resilience against a rainfall event with a chance of 0.5% chance of occurring in any year. 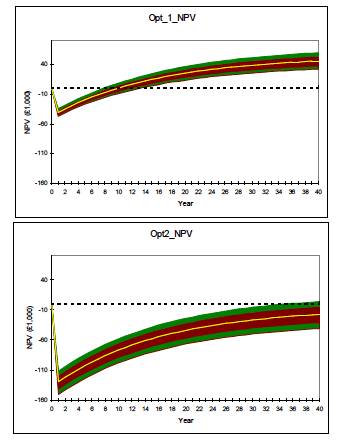 The initial drop in Net Present Value (NPV) represents the cost of the intervention, but over time, the benefit is realised. @RISK therefore shows that this activity is worth undertaking within bounds of uncertainty. In contrast, option 2 shows the effect of adding an additional level of protection such as adding an extra 300mm to the floodwall. @RISK shows that the extra cost in designing and building this is unlikely to be worth the small amount of extra protection it provides in the long term with the current understanding of the problem. Quantifying the uncertainty in the calculations encourages more adaptive planning approaches.